Sonoma County has benefited from the NASA-funded 2013 LiDAR data in many ways. One recent example is the County’s GIS Group’s use of the LiDAR-derived hillshade for improving road centerline delineations. Road centerlines have many uses: they form the base reference layer for navigation, they are critical for the county’s emergency response services, they serve as a key input for natural resource conservation planning, and they are integral to the operations of county and state agencies that maintain the county’s roads and transportation network. Until now, road centerline delineation relied solely on orthophoto interpretation and occasionally GPS data collection, which can be costly. Since dense tree canopy sometimes covers roads, which renders them invisible on orthophotographs, the road centerline data is prone to accuracy problems. Additionally, GPS error increases under tree canopy, which can lead to accuracy problems even for road centerlines mapped with GPS. Now with the LiDAR bare earth hillshade, which provides a three dimensional depiction of the ground even under canopy, we have a way to significantly improve road centerline accuracy. The image below shows a heavily forested section of Fort Ross Road (the road is shown in dotted yellow). The top pane shows the 2011 orthophotography. 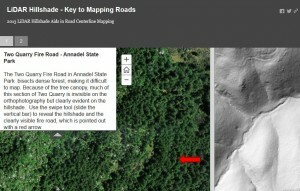 Because of the high tree density in this area, locating the road with the photo would be guesswork. However, in the bare earth hillshade (bottom pane), the road is clearly visible in darker tones than the surrounding landscape. Check out this story map to see explore some areas that illustrate the benefits of using the LiDAR hillshade for mapping road centerlines. 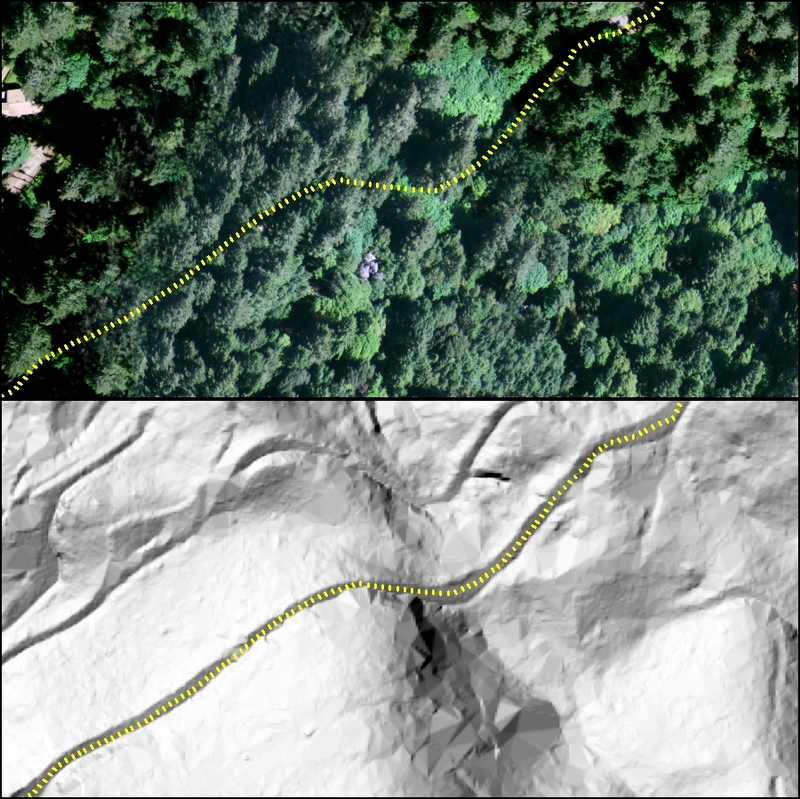 Using the LiDAR bare earth hillshade, County of Sonoma Information Services Department (ISD) GIS Group has made significant strides in correcting misaligned centerlines under canopy in the countywide roads dataset – the result is a greatly improved and much more reliable roads layer. The Sonoma Veg Map team is using similar techniques to contribute improvements to the roads layer for use in impervious surface mapping. This entry was posted in LiDAR, Uncategorized on May 9, 2015 by admin.